What are our processes of research and how can a supportive research culture be nurtured in the art museum? These were the questions posed during the half-day seminar I facilitated at Tate Britain on May 24th. Following on from the event in April, this seminar was attended by many of the same colleagues, with some new faces. Once again the afternoon comprised moments when I shared ideas emerging from my research, along with rich and stimulating discussion prompted by what I said and the tasks everyone took part in. As with the first seminar, we addressed several issues, not all of which I will cover here. Instead what I want to focus on is the value of drawing as a means of communicating ideas, since during the afternoon we explored and made explicit our thinking at times diagrammatically. The first task each person undertook was to draw their research process. In my interviews with museum professionals I have often asked them to do this and have found it reveals the complexity, but also the commonalities of research across different fields. The same is true of the drawings completed by curators, academics, museum educators, policy makers and artists at the seminar. People highlighted the ‘troubling’ and/or interesting issue that generates the questions that prompt and underlie research. They represented how these questions are explored through experimentation and testing, nearly always with others. Collaboration, consultation and co-investigation in different forms is represented across the diagrams. The language of looking, reading, investigating and ‘getting underneath’ something crops up often, as does thinking, refining, evaluating and analysing. Diagrams are frequently linear, but incorporate feedback loops and circular processes, indicating how knowledge and ideas return and inform the research process, but also shape and change practice. Dissemination through different forms is present in the drawings, and in some there is a clear indication that research needs to bring about change in the world. To me, the diagrams communicate how vital research is and why museum professionals can gain so much from engaging with it. There is an immediacy and humour in the drawings that is not always evident in text, yet they provide a clear and compelling record of each person’s ideas. 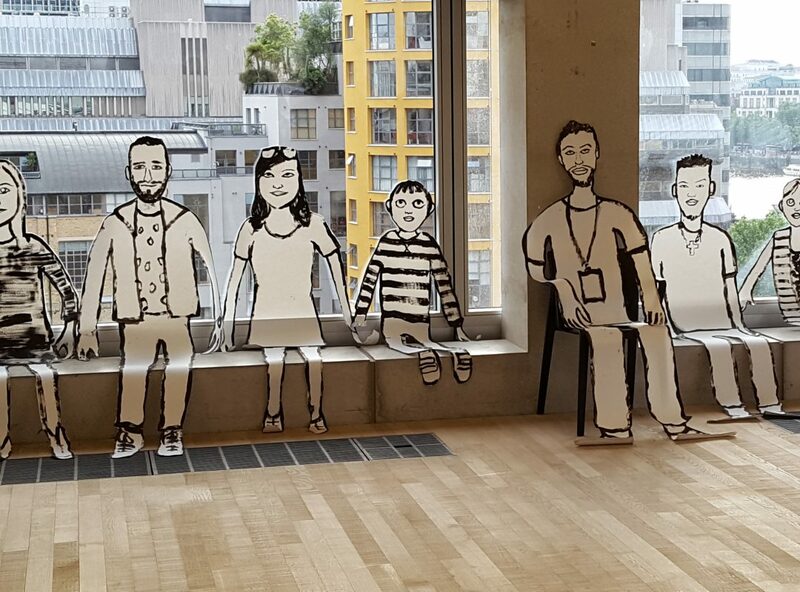 There is growing acceptance of visual methodologies within social research, with drawing seen as a practice that allows for knowledge production. ‘Visual products’ as Marilys Guillemin identifies in her study of how drawing can be used to explore how people understand illness conditions, illuminate how people ‘make sense of their world’. My own art practice is centred on drawing and in the latter half of the seminar I shared an image I have been working on. ‘The Practitioner Researcher Tree’ attempts to encapsulate the elements needed to foster a culture of practitioner research in the art museum. It represents my sense of an ideal organisational culture. Underpinning the Practitioner Researcher Tree and providing the necessary support is leadership that is committed to research. These experts model curiosity and maintain a commitment to learning. Embedded at the base of the tree are an explicit set of values and ongoing evaluation. Together these provide clarity and evidence to inform careful and purposeful enquiry. At the core of the tree lie the intertwined principles of trust and risk. These sustain an environment where practitioners feel empowered to explore and test ideas. This tree is expansive and open, with branches of different knowledge that co-exist non-hierarchically. These are connected throughout the whole and shared through continuous communication. Furthermore, the tree is enriched and shaped by the diverse expertise that it comes into contact with and brings about change through its own explorations. It is part of a wider community of knowledge. The tree, like all living entities, is continuously growing and transforming, but at a pace that is appropriate and sustainable. Finally, the tree requires nurturing so that it develops productively. It cannot be left unattended, but instead thrives on care and attention to its constituent parts. The ‘Practitioner Researcher Tree is very much work in progress and I see this image as the first iteration. The process of considering the ideas and how best to communicate these visually is extremely rewarding. It has helped me to think more laterally and tangentially, to explore connections and move away from a strict linear trajectory. I received some helpful critical feedback at the seminar on how it might be improved. At the same time the image prompted interesting discussion, not least on whether the analogy of the tree could be expanded further. Could I represent the elements such as ‘diverse knowledge’ as the leaves that grow and then fall, replenishing the tree through this ongoing cycle? Could I include a cross-section of the tree, to make the connection between time and the annual rings that reveal the tree’s age? In this way the drawing seemed to offer open possibilities for interpretation and exploration. This feedback and the conversations throughout the two seminars have demonstrated to me the importance of testing ideas with colleagues and the considerable contribution those attending have made to my thinking. Drawing and dialogue, I am learning, are extremely helpful to my own research process.